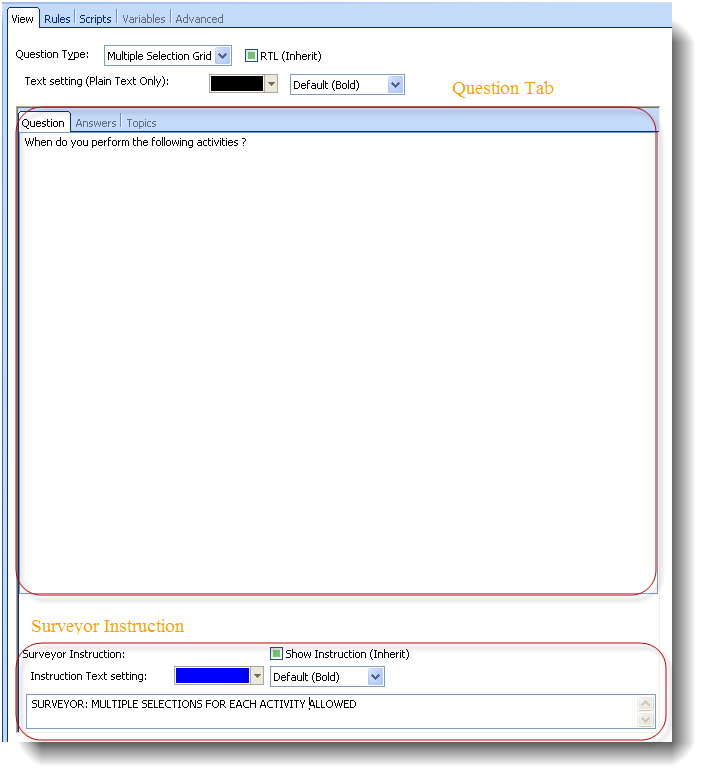 In the view tab you can configure the basic components of a question, such as its body text, its answers and its topics. 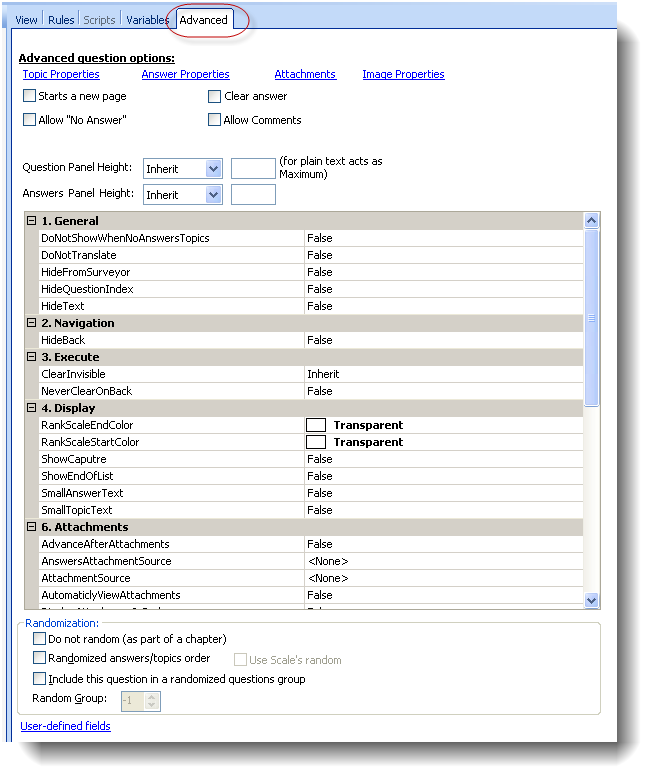 Under the question's tab, within the View tab, you can define the Questions Body Text and the surveyor's instructions if any. "When do you perform the following activities?" 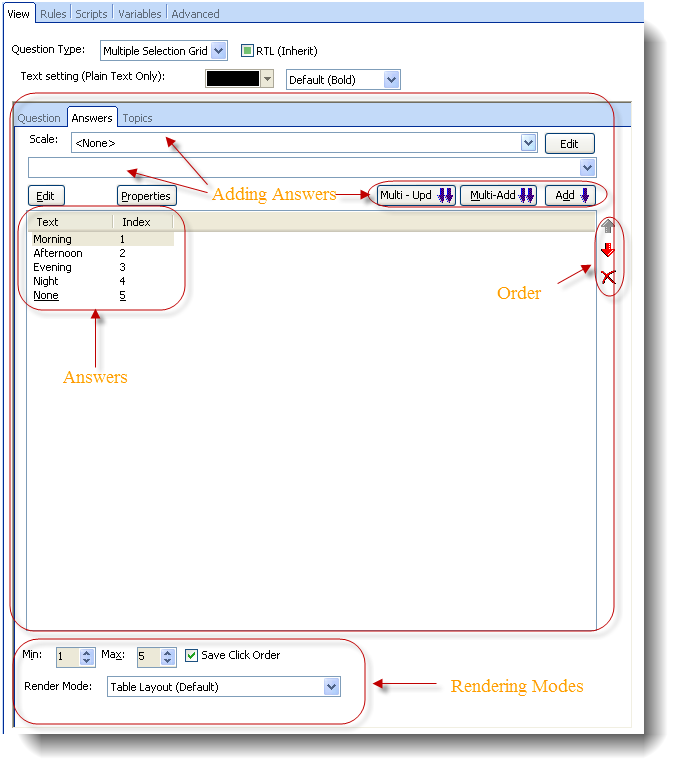 "SURVEYOR: MULTIPLE SELECTIONS FOR EACH ACTIVITY ALLOWED"
Writing the answer's text in the given text field, and hitting 'Enter' or the 'Add' button. The index column represents the position order of the answer in the answers list which is given automatically by the system and is then used when referring to answers values with functions. The 'Edit' button for the scale allows you to jump directly to the scale's editing mode. The 'Edit' button for the answer allows you to edit its text. The 'Properties' button allows you to configure the selected answers properties. The type of button's \ answers representation. Define the minimum\maximum selection for each topic. Save the selection order when exporting. The topics tab allows you to configure & set the topics of the grid question. 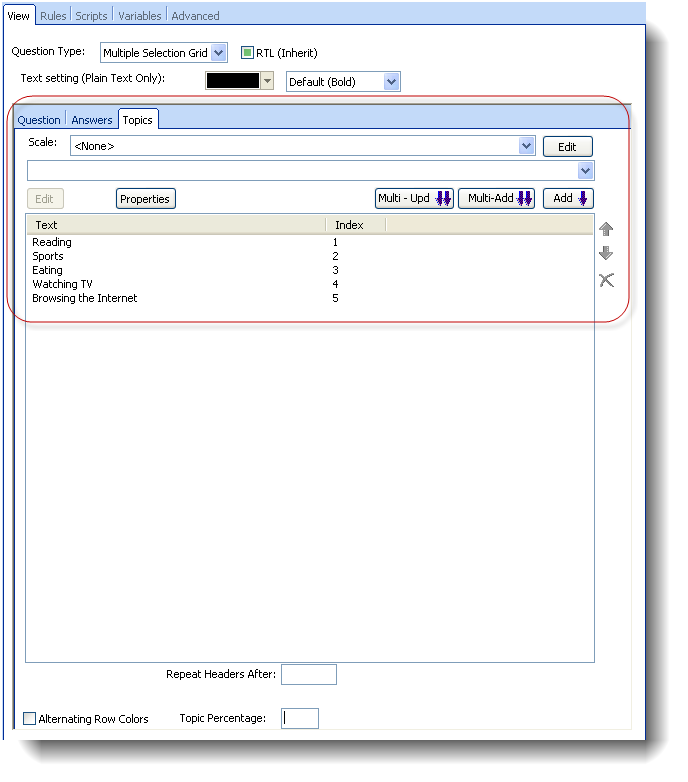 'Topic Percentage' – Set's the amount of percentage out of 100% that the topic column will take out of the table (only in Table Layout rendering mode). Export each answer as a variable – Each answer & topic combination will be displayed as its own column in the exported file,, for example 'T_1_2_O_2' will represent topic 2, option 2. 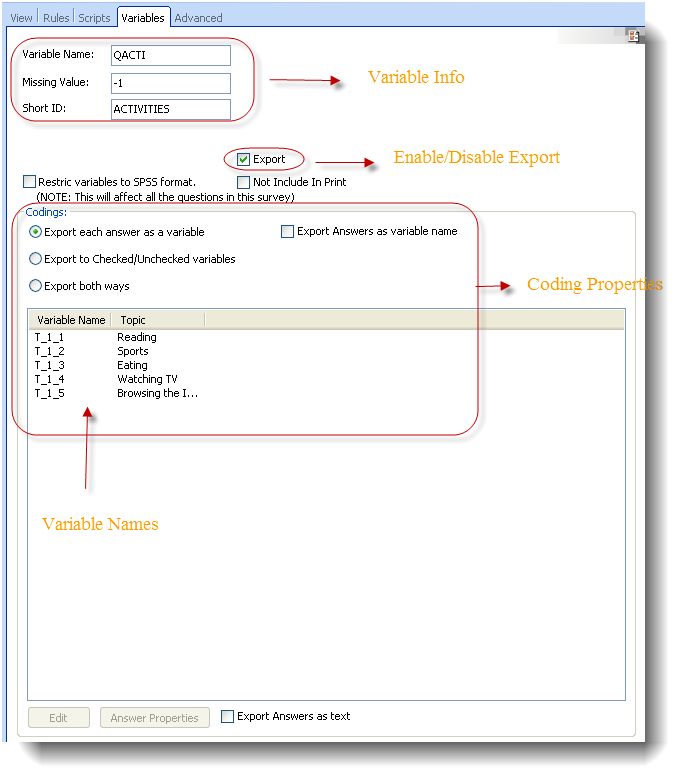 Export to Checked/Unchecked variables – Each answer & topic combination will be displayed as its own column in the exported file, for example 'T_1_2_O_2' will represent topic 2, option 2, if it was selected it will get the 'Checked Code', if it wasn't selected it will get the 'Un-Checked code'. Export both ways – will export both ways one after the other. Export answers as variable names – will have the answers selected coding replaced by the answer variable name instead of the answer index. 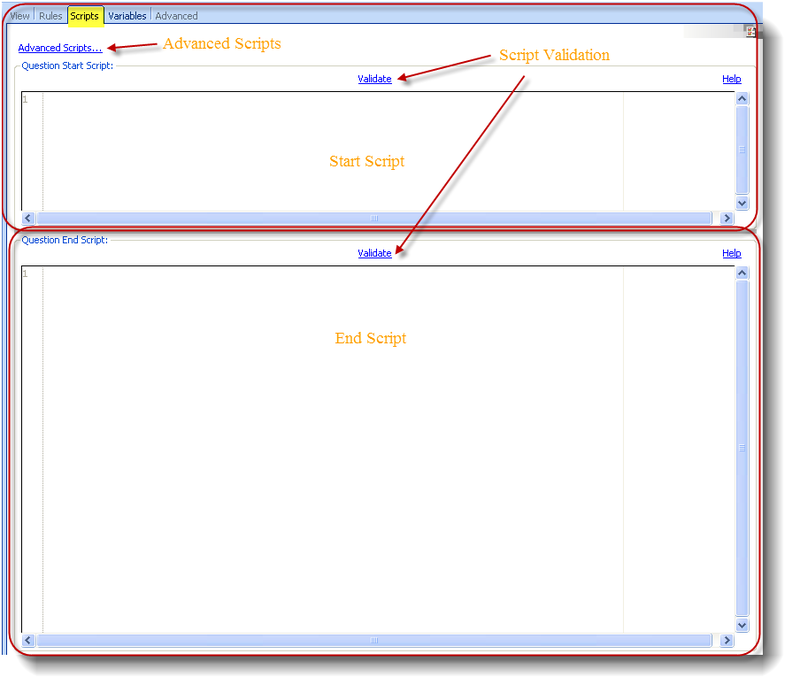 Export Answers as text – will replace the selected coding with the answers text. 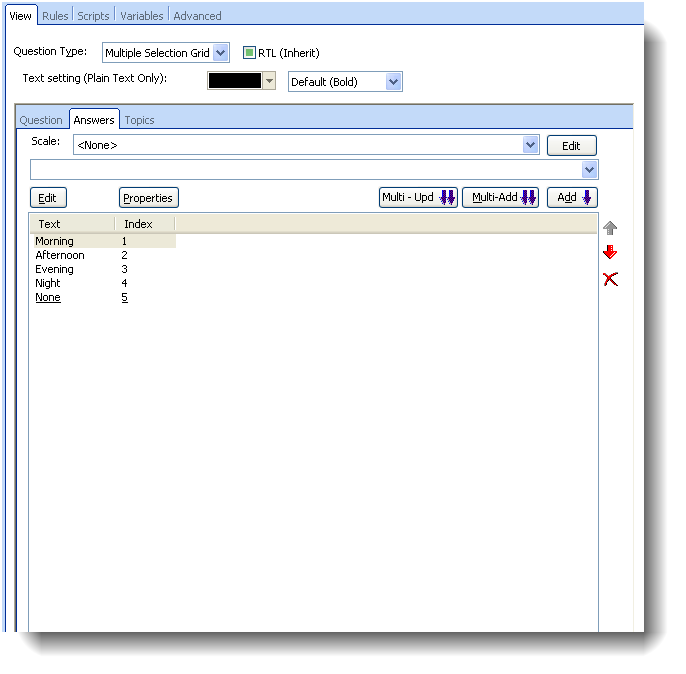 Please Note: 'Other Specify' is not supported in multiple-selection grid questions. This picture represents how this question is exported. Please note the marked Topic X Answer combinations for each of the 5 topics & 5 answers available. I was trying to use "AnswerChoiceSelection" but failed. Unable to find any user guide for this. Please help. 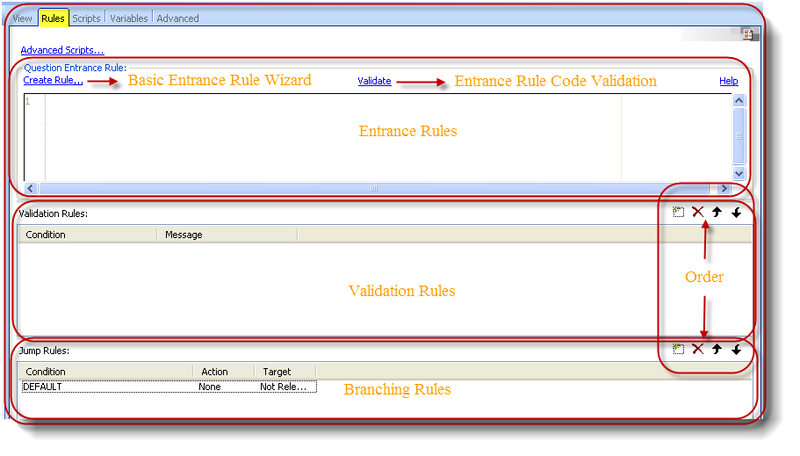 This function is documented there. Thanks for the documentation. However, the .cfm file that extracted from the .zip file is not working. Screenshot attached. Please help. Thanks. 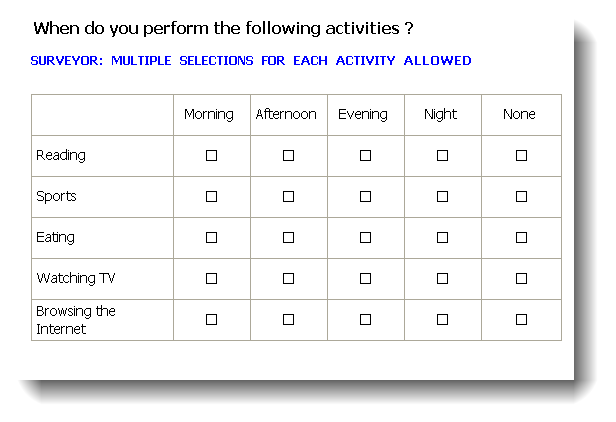 in a multiple/single selection grid is it possible to disable some of the options/answers (check boxes) for few of the topics? Hello. Is it possible that with this kind of question (Multiple selection grid or Single choise grid) we can add any text or numbers? If it is possible how can we do this? As we will need to ask you several questions so we understand your precise need we have passed this to the support team as a support request and you will receive an answer from a support agent.